It’s considered to have been founded in ancient Greece, by a general called Xenophon, but the foundations of modern dressage were laid in the 18th century by Vienna’s Spanish Riding School. Today it’s the fastest-growing equestrian sport in Europe, in which horse and rider are judged on tests comprising a series of movements (known as figures) and transitions (smooth changes in pace). The highest level – Grand Prix Freestyle or Kür – is performed to music. 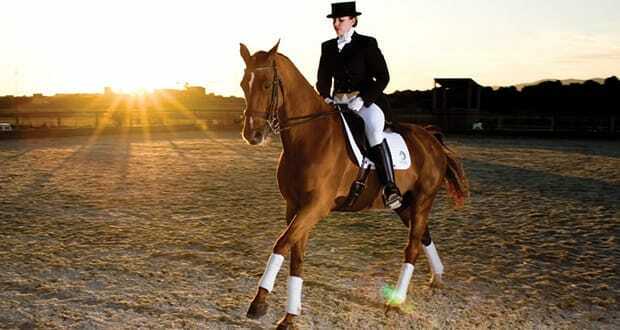 Dressage should look effortless on the part of the rider, who commands by subtle body movements. All eyes are on the noble horse. Michael should know: his wife Marian and 27-year-old daughter Layla (an Olympic hopeful) are accomplished dressage riders for whom he bought and developed La Paz, when the family moved here last year from Sotogrande. It’s a private yard and doesn’t offer lessons or livery. Equestrian activities on Mallorca are governed by the Federació Hipica de les Illes Balears (sanctioned by the Spanish federation and FEI, or Fédération Equestre Internationale). “One of the big problems is that the FHIB doesn’t have a lot of money for dressage and can’t finance the yards,” Michael says. The once-popular sport here suffered a decline, but things are looking up: there are now around 80 dressage riders on the island, and the number of competitions has grown. In co-operation with the FHIB, Michael introduced La Liga de la Paz: “We’re purely involved in dressage here – quite fanatical about it – and I’m prepared to lose money to boost the sport.” He puts on “lavish competitions”, with prizes of up to 500 euros in vouchers to spend on equestrian goods. Not surprisingly, the number of La Paz Liga competitors has grown steadily, to around 50 for each event – with increasing numbers of spectators. “The more who view it, the more want to do it,” Michael says. 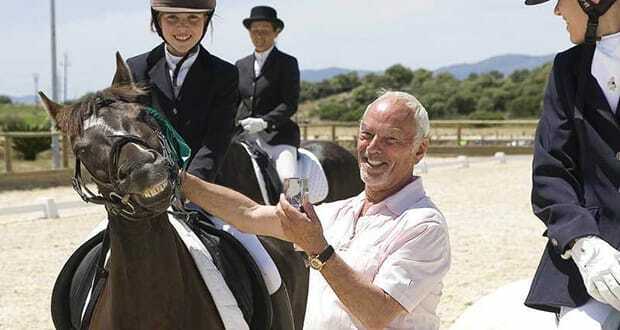 He believes he’s created the best dressage facilities in the Balearics, and close to best in Catalunya. Ninety-two trucks delivered the sand – imported from Cadiz – for the riding surfaces, which have computer-controlled moisture levels. Special lighting creates a daylight setting for evenings. “It’s more than I wanted it to be,” Michael admits. “A bit like being on a steamroller that I didn’t want to get off!” It’s an ongoing labour of love, “but there’s method in my madness,” he adds. He’s bought twelve horses to be trained and sold, so La Paz is also Michael’s impressive “shop window”. Natascha Weber, FHIB dressage committee member, says lessons are teaching her 16-year-old daughter Claudia “tenacity, hard work, and the ability to lose – and accept losing.” Natascha recommends that anyone wanting to learn dressage in Mallorca looks for a knowledgeable licensed teacher. Expect to pay around 20 euros for an hour’s lesson. The FHIB website has details of licensed trainers, clubs, and safety measures. 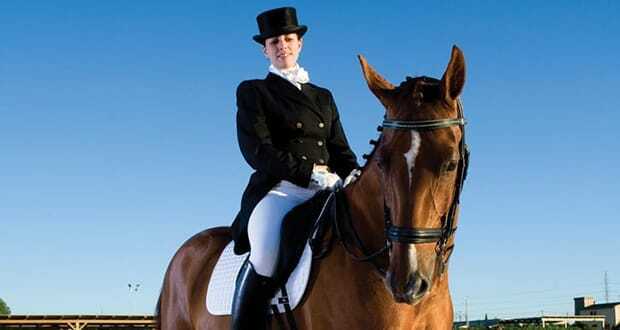 “In Germany, it’s mandatory to learn the basics of dressage when starting to ride,” explains Natascha. “A child who wants to be a jumper needs a solid grounding in dressage to be able to sit, steer, balance and control the horse safely as their jumping progresses.” German rider Marcel Remus started dressage when he was 10 and is passionate about its benefits for children. 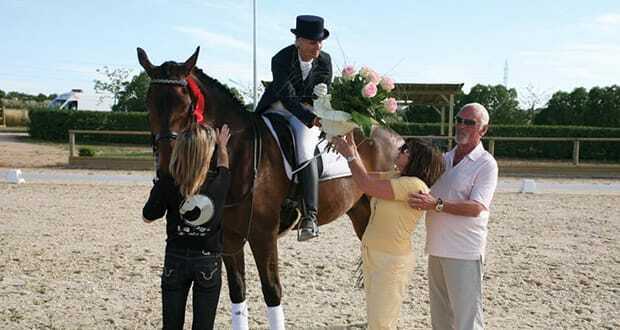 The Balearic Dressage Champion 2007 says Mallorca is a great place for the sport because the winter climate is suitable. He spends 12-14 hours a day in his office (selling real estate, sport horses and equestrian supplies), and riding is his relaxation. And the future of dressage on Mallorca? “I’ve seen more and more people competing here, and I think the sport has a very good future,” Marcel says. Xenophon would approve. We hope you have found this article about the Equestrian Elegance useful and that you have many memorable stays in Mallorca as a result of our recommendations.